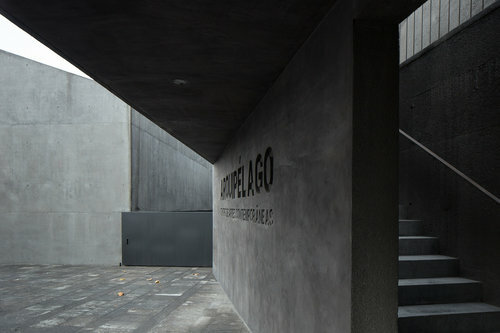 Already this year the design blogosphere has exhibited a fascinating and exciting body of work, not least of which is a number of interesting adaptive reuse projects. And while the more excellent projects are usually catalogued by The Field, there are always a few that deserve special celebration and attention. The projects below are the best of those, exploring different ways to intervene, recreate, reinhabit, and recycle historic structures for new cultural iconography. 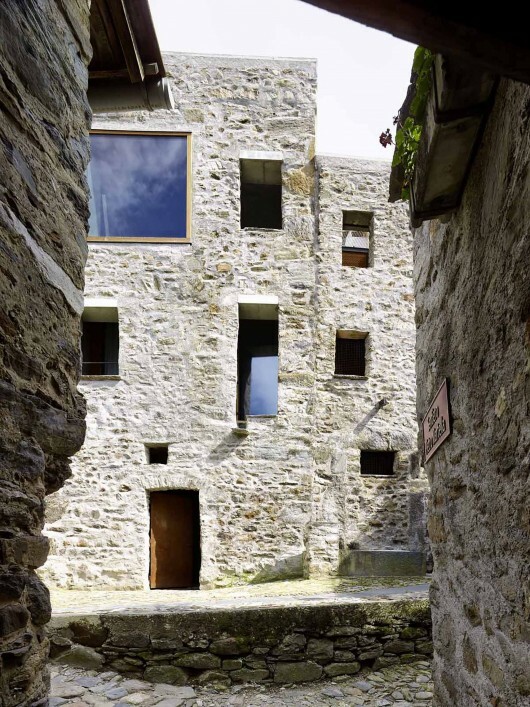 Located in the historic center of Scaiano, this adaptive reuse project is a gem of intervention. The original structure (date not given) consisted of two levels over a semi-buried, vaulted, ground level, built of heavy, unfinished masonry, and was left vacant for two decades before the project. In addition to bringing the building up to code, Wespi de Meuron completely re-imagined its programming, cirulation, and massing. In some interior places, the entire structure was seen as an object to be carved into. 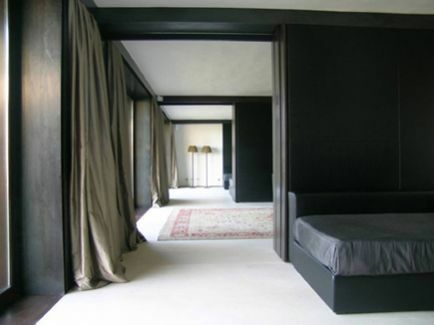 In other places, preexisting spaces were refinished and cleaned up. 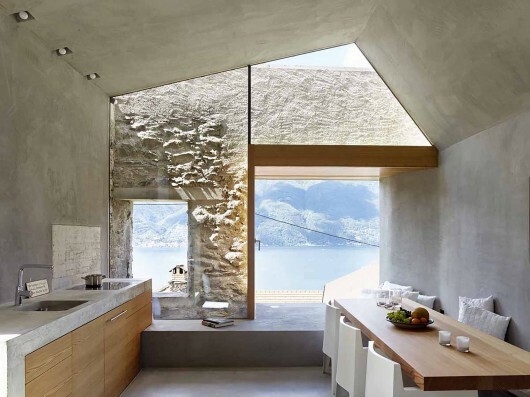 With other, exterior moments, however, the architects exposed the historicity of the preexisting object by setting a glass envelope back behind the original masonry. This by itself is a brilliant method: seeing the structure as an opportunity for subtractive, plastic work while simultaneously seeing it has an opportunity for layering meaning and exploiting its haptic historicity. The result is a fascinating piece of architecture, in a moment isolating and archaic, modern and deeply layered in the next. 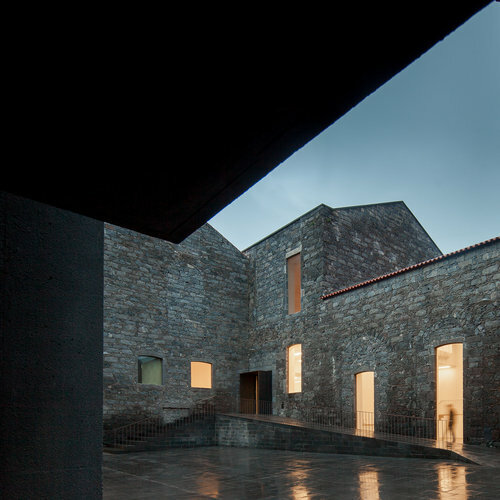 In a way this project is the opposite of Wespi de Meuron’s, not in its program per se—the Scaiano House being a residence and the Arquipélago being a public center—but in its conception of the preexisting object(s)’s historicity. The original buildings were a series of warehouses (alcohol and tobacco), and instead of seeing them as a volume or field in which to intervene, Mas É Mais built simple, almost abstract volumes right next to them, expanding the series into a larger field of objects, an “archipelago” (if you will) partially hidden / protected behind a wall. The effect is to create an isolated collection, a group redefined by the abstraction of its masses and its various artistic programs. 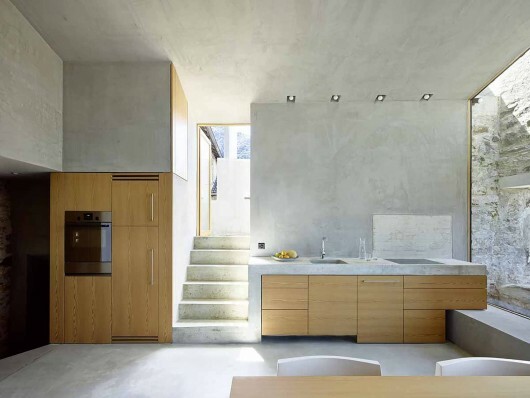 The archipelago’s isolation also creates a kind of cloistered atmosphere, engendered by the austerity of its original masonry and contemporary concrete. 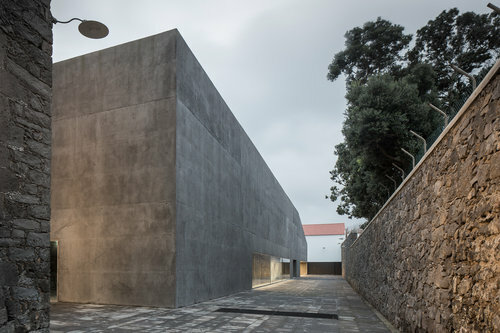 In addition, the iconography of the original warehouse silhouette is exploited through its cloistering wall, transforming the project’s interiority into an public-oriented sign of its own purpose: to raise awareness of the history of the Azores and indigenous culture. The project’s incredible massing and atmosphere is made all the more potent by the work of Jose Campos, who took the images below. 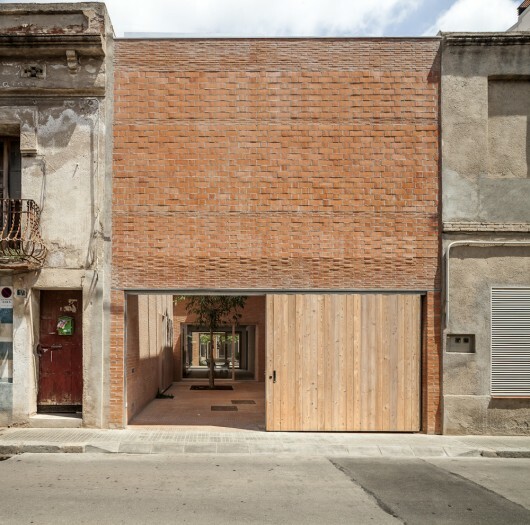 Speaking of cloistered isolation, I present “House 1014,” a residence built on a long, narrow lot between two historic facades in the historic center of Granollers, Barcelona. 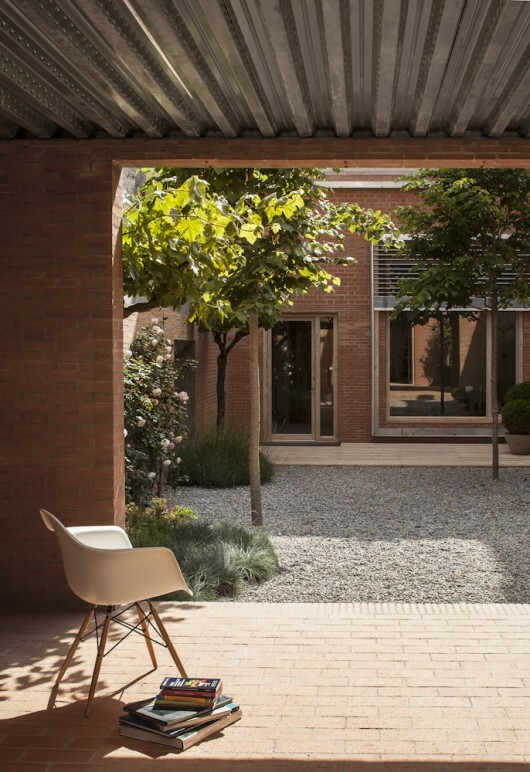 The family commissioned H Arquitectes to build a house composed of two volumes—one for private living and another for entertaining—separated from each other by a courtyard and from the party walls to allow for green considerations. Each volume, one at each end of the lot, is separated from the street by a conscious layering of facades and micro courtyards that isolate the front façade and immediately build a complex system of space and habitability. In addition to this game of inside-outside set up by layering the multiple facades and volumes behind each other, H Arquitectes structures a separate strategy of transparency through the volumes through almost-aligned windows and doorframes. Even the parking area is sheltered between two facades (the back, historic façade and a residential one) and under sun-shading louvres in a pseudo-court complete with trees. In the case of House 1014, the isolation of the historic elements is not so much a conversation about new and old, but a shelter, a game played to privatize the interior. 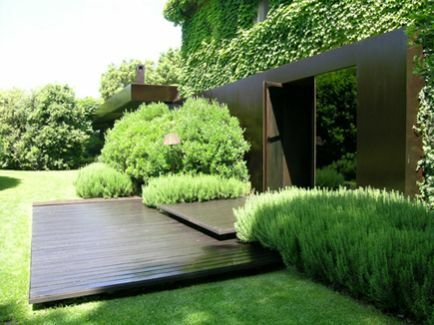 Three different expansion projects to various Tuscan Villas by the Italian firm Lazzarini Pickering have been making the rounds through the design blogosphere and tumblr-verse. Unfortunately, this momentary quasi-fame is mostly misinformed, often presented as a massive single project so opulent that it seems more like a villainous hideout from James Bond than an actual residential, adaptive-reuse project. Nevertheless, the three projects together are beautiful in their simplicity, the unassuming quality of LPA’s new work. 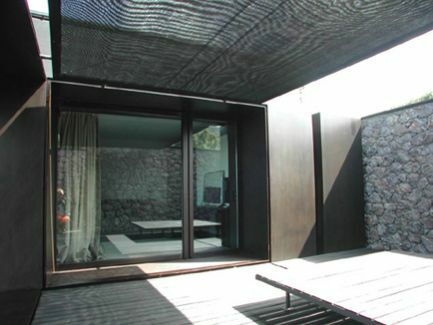 Juxtaposed with the vine-covered medieval buildings and gorgeous natural surroundings are unassuming orthogonal, clean boxes of black and reflective glass. In another, masonry low rises unassumingly sculpted into the landscape shelter age-old, in situ suites opening on a green court. Yet another project practically suspends a glass box above a wooded grade. All are simple projects, almost quotidian in the body of contemporary work, unassuming and mundane. But together they attest to an almost poetically simple language of contemporary architecture’s relationship with preexisting, historical material. Check out The Field for a (usually) daily feed of good contemporary design work.